Ephraim James - Production Mgr. Kristine May - Circulation Mgr. Roger A. Grawe - Fulfillment Mgr. Joshua K. May - Marketing Mgr. Wayne N. May - Advertising Mgr. 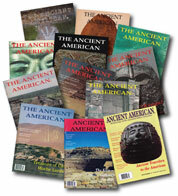 The purpose of Ancient American magazine is to describe the prehistory of the American Continent, regardless of presently fashionable beliefs--- to provide a public forum for certified experts and nonprofessionals alike to freely express their views without fear nor favor. 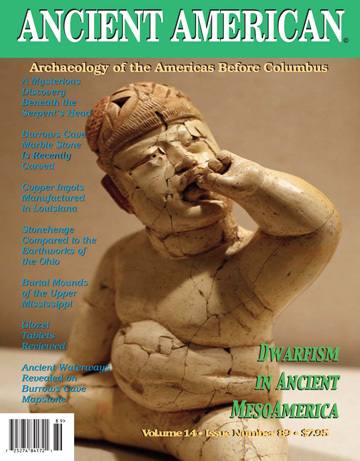 In sharp contrast to majority academic opinion, its editorial position stands firmly on behalf of evidence for the arrival of overseas visitors to the Americas hundreds and even thousands of years before Columbus--- not only from Europe, but the Near East, Africa, Asia, and the Western Pacific. 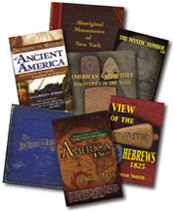 Each issue presents such otherwise neglected and even suppressed factual evidence demonstrating the lasting impact made on the Americas by Scandinavian Norsemen, Pharaonic Egyptians, Bronze Age Mediterraneans, Semitic Phoenicians, West Africans, Dynastic Chinese, seafaring Polynesians, and many other culture- bearers. All contributed to the birth and development of numerous and sophisticated civilizations which flourished throughout the American Continents in pre-Columbian times. It is the magazine's purpose to show readers just how, when, and why these once powerful societies arose to great heights of cultural splendor and fell into deep obscurity as dramatic object lessons for our time. No rehash of well-worn theories, Ancient American offers up-to-the-moment news about ongoing discoveries and original perspectives, bringing to light a surprising abundance of fresh material that is seriously challenging entrenched conceptions of our past. As such, our staff and contributing reporters believe they are writing a New History of our nation by convincingly offering research that, in the coming century, will amount to virtually a total revision of American antiquity. Because of its revolutionary potential, Ancient American, although authoritatively written, is not a scholarly journal. It is a popular science publication specifically aimed at attracting the broadest possible general readership, while refusing to compromise its scientific credibility. Ancient American is an open forum for anyone, regardless of academic background, to share their discoveries and ideas about the prehistory of our country with readers across the nation and around the world. 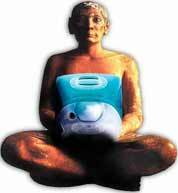 As an exercise in freedom of thought, we welcome the participation of amateurs, in addition to professionals. In turn, public input is accepted and encouraged. Feel free to contact us about subscriptions, book orders, back issues, change of address, article submissions, advertising, books for review, and general information. Article submissions are encouraged, but must meet our requirements. Contact us for more information. RETURN POLICY: We offer a 30 Money Back Guarantee on almost every product we offer. Please call customer service at 877-494-0044, in advance to obtain an RMA number (Return Merchandise Authorization) within 30 days of purchase date. Merchadise for return must be clean and in original condition to qualify for refund.